Two new technological conferences called "Korean Forming Technology Day" took place last month in Korea. The Korean Stamping Technological Conferences were held last month, on 26th in Seoul and on 28th in Gyeongju. These showed the most advanced technologies and the situation of technology in the field of sheet metal stamping. During the conferences, Fagor Arrasate, as a sponsor of the event, presented the latest advances in Servo-technology, which is a key factor nowadays in the manufacturing of motor vehicles and which is undergoing extensive development. SPT, Servopress Technology, offers the possibility to produce much more complex parts through the total control of the stamping process and guarantees a high energy efficiency in terms of environment. 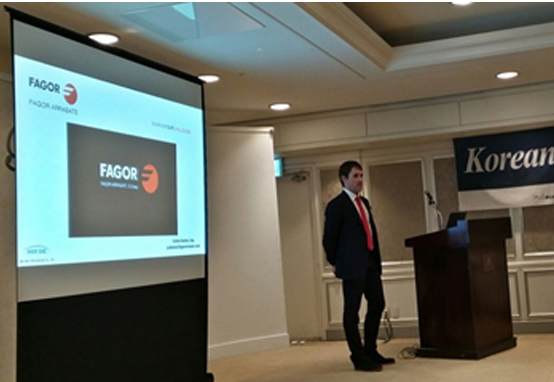 After its successful projects in the Korean motor vehicles market, Fagor Arrasate wants to continue to take the Korean motor vehicles industry by storm, not only through the internal market, but also through its projects abroad.